You may not be able to remember a time without Christmas tree light, but interestingly enough this tradition does not date from time immemorial. While the lighting of fires and candles has a long history in the practice of many of the world’s religions, the practice of using light to adorn trees dates only to the middle of the 17th century. A custom arising in what is now Germany, the lighting of trees was accomplished by attaching candles to trees with pins or wax. For this reason, trees were rarely put up and surely not lit before Christmas Eve. The practice of lighting tree with candles started to be seen in the US starting in the 1850’s as German immigrants brought the practice with them. Shortly thereafter, Queen Victoria the arbiter of great style began lighting a tree, where upon the US White House followed suit. It was not until 18882 though that a tree was lit with electric Christmas light bulbs. Edward Johnson, an associate of Thomas Edison is crediting as being the first to use electricity for Christmas tree lighting. He hand wired 80 red, white and blue holiday lights and placed them on a rotating pine tree. Thirteen years later Grover Cleveland chose to have the nation’s tree lit with electricity causing a stir and resulting in retailers following suit. An expensive endeavor at the turn of the century, a lit Christmas tree could cost a small fortune and thus was reserved only for the wealthy and their showy parties. Preparing a tree required a wireman to light it and the installation of a generator. By the end of the first decade of the 1900’s the concept had evolved to include screw-in bulbs, a wall socket plug and also a system that relied on telephone switchboard lights and a battery. In 1915 in answer to a tragic Christmas tree candle fire, Albert Sadacca came up with the idea of manufacturing electric lights on a string. Eventually Sadacca’s idea evolved into the NOMA Electric Company which until 1965 was the largest Christmas lighting company in the world. 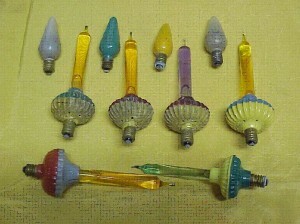 Following Sadacca’s path various companies sprang up offering a dazzling array of bulbs, just a few of which are pictured here. So as you prepare for the Christmas holidays this year, take solace in knowing that the practice of Christmas tree lighting is a fairly recent one–one that you should not stress out over too much. Simply use the lights you have on hand, pick up some of the new LED Christmas bulbs or hire yourself a Christmas lights professional. Have yourself a bright and merry holiday!